Katmai Trophy Lodge is a custom log lodge on the banks of the World Famous Naknek River in Bristol Bay, Alaska. We are located at the edge of Katmai National Park and permitted to access much of Katmai's amazing Salmon and Trout fishing waters. Each bedroom in the Lodge features queen beds and a private bathroom. The two story great room windows are just feet from the river's edge. 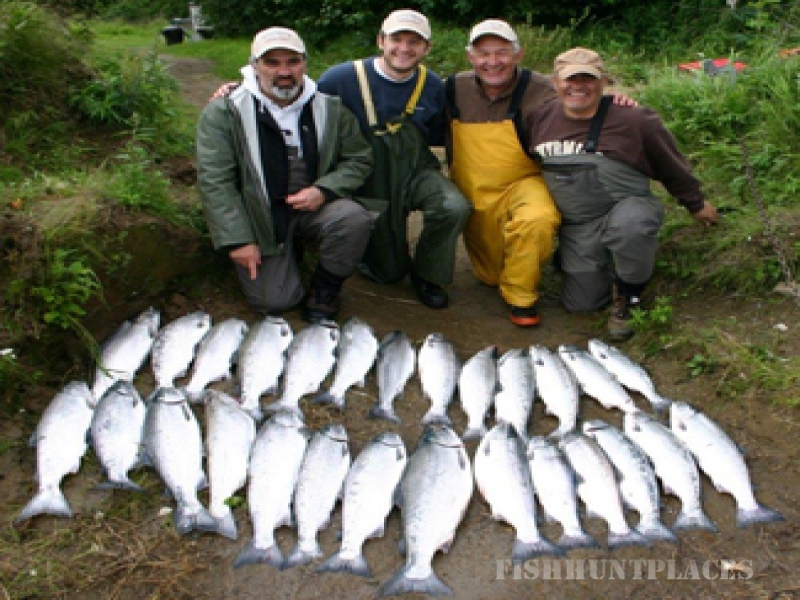 The Naknek River offers the best Trout and Salmon fishing in Alaska. Whether you are looking for an intense fishing experience or an easy Katmai Adventure, our Alaska Fishing Lodge is the place for you! 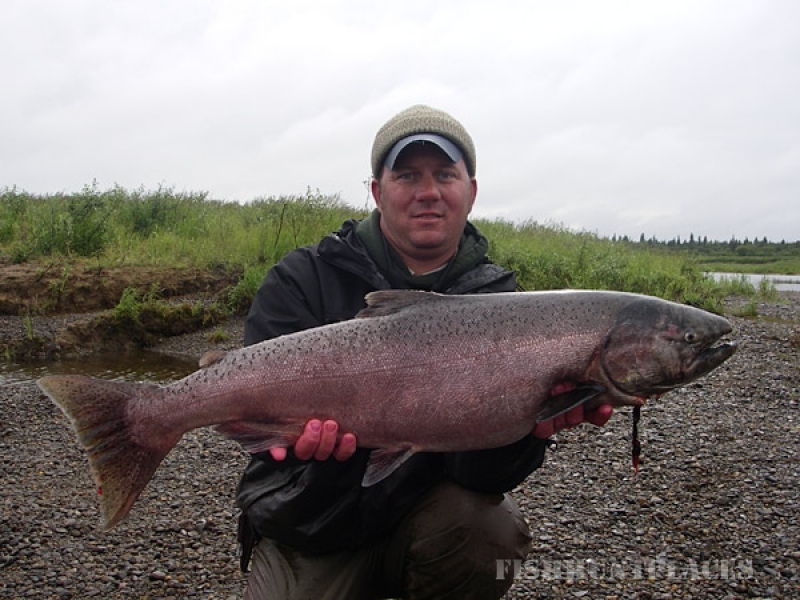 Check out our website for the top Alaska Fishing Packages and Lodging. 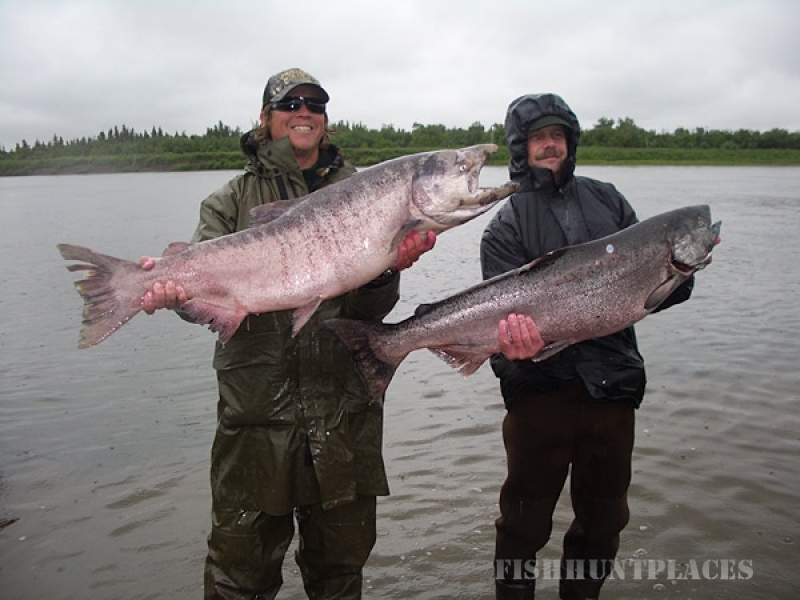 The Naknek River boasts major runs of King ( Chinook ), Sockeye ( Red ), Silver ( Coho), and Chum Salmon along with Monster Rainbow Trout and Arctic Grayling. Expect 1 to 2 million Salmon per year to enter our River. The Naknek River and the surrounding Katmai National Park are also excellent habitat for bears, bald eagles, moose, wolves, caribou and other Alaskan wildlife. 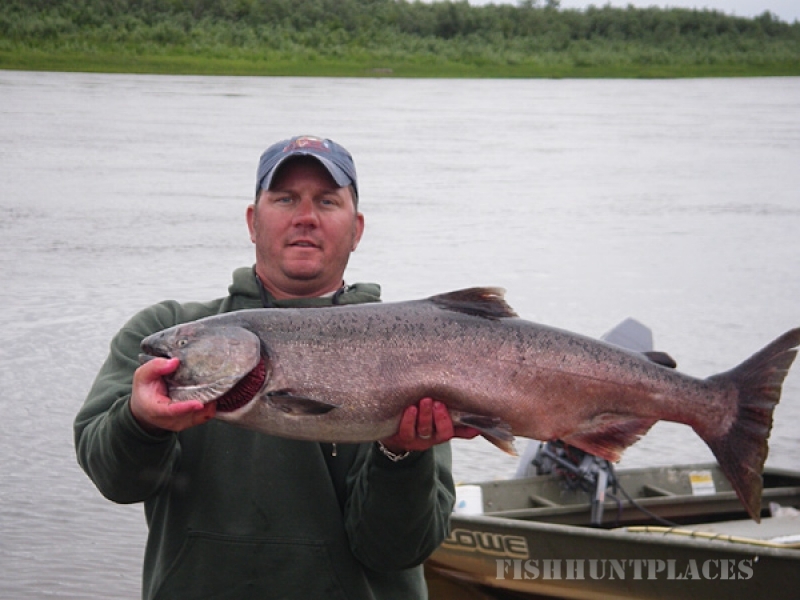 Visit the Naknek River and Bristol Bay in June and July for trophy King Salmon fishing. These monster fish average over 30 lbs and can reach up to 60 lbs or larger. In late June to the end of July the river receives Bristol Bay's largest Sockeye Salmon run, some days hundreds of thousands of Sockeye's enter into the Naknek River. In late July through September we will be fighting the acrobatic Silver Salmon ( Coho ). Pound for pound the Silver Salmon is the top fighting Salmon. Perfect for fly fishing, the Silver Salmon will also take top water flies or lures for the spin fisherman. Even with record runs of Salmon the real prize on the Naknek River are the Trophy Sized Rainbow Trout. 10 lb. Rainbow Trout are caught on the fly with some fish over 30 to 37 inches in length. This is truly the finest Rainbow Trout fishing in the world. We cater to both the fly fisherman and the spin fisherman, from novice to expert. Much of our fishing done by walking and wading but we also offer lots of opportunity for boat fishing and/or drifting. Our prime location gives us access to fish most waters of Katmai and also most of Bristol Bay on our fly out fishing trips. Airplanes are available for fly out fishing trips to Katmai Park and other locations in Bristol Bay. Also a short flight away is the Brooks River and one of the most famous Bear Viewing locations at the Falls. Go for the day and enjoy the wildlife or cast for beautiful Rainbow Trout in the Brooks River.